If she could spell (or at least had the intelligence to not ignore spell check), then maybe she would get the sexual harassment she desires. Seriously, women complain that men are supposedly sexually harassing them. Then women realize they miss it and complain that men aren’t sexually harassing them. 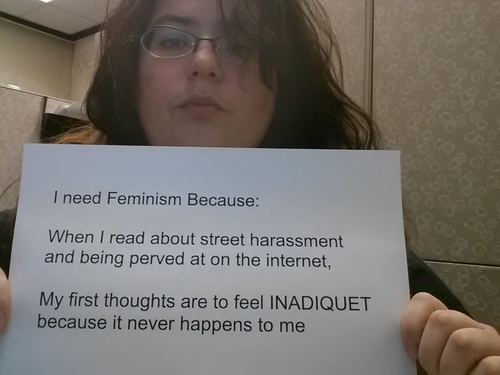 Sorry, men aren’t going to sexually harass you just because you beg for it. FIRST — “they need feminism” because the Big Bad men ‘sexually harass’ them. THEN — “they need feminism” because the Big Bad men DON’T ‘sexually harass’ them, and it makes them ‘feel inadequate’ (i.e., hurts their feeeeeelings). Commander Spock* was right — human females are “a mass of conflicting impulses”. Illogical females like this one make me glad that I took the red pill and went My Own Way when I was still young; it undoubtedly helped keep me sane, single, and childless. * Actually it was either Gene Roddenberry or one of the other writers. This woman has NO idea how BAD (however truthful) this picture makes women look. Wow. Just wow. The narcissism and selfishness displayed here is astounding. This is evil behavior not to be simply laughed at. To think I wanted to find a woman and please her…. Let alone voluntary celibacy, even the prospect of turning gay sounds reasonable now.